– “Where joy comes from learning and sharing the love of JESUS! 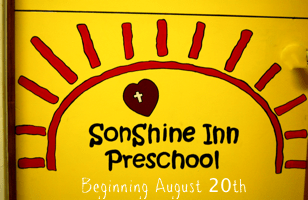 – A quality preschool education in a warm Christ-centered atmosphere. – Experienced teachers, Terri Childers and Brittany Jones will help your child grow & develop spiritually, socially, emotionally, and intellectually. – Classes are Tuesday, Wednesday, & Thursday during the school year. – Our morning 3 year old class teaches the preschool basics of education along with fun & faith. – Our afternoon 4 year old class will fully prepare them for kindergarten. – Our small class size allows for personal attention and enriching field trips with our balanced and creative curriculum. * Remember enrollment is limited. Please contact Terri Childers at 580.363.2532 for more information.